Updated 3:30pm to include Frost Advisory. Summary: Great Easter Weekend. Chance of storms every day the upcoming work week. After yesterday’s storms, today will be pleasant but a bit cooler. Today’s high is expected to be 62 degrees as clouds make way for sun as the day progresses. Winds will be out of the north at about 5-10 mph. Take a light jacket with you tomorrow should you have any holiday plans. PLANTS OR BRINGING THEM INDOORS. 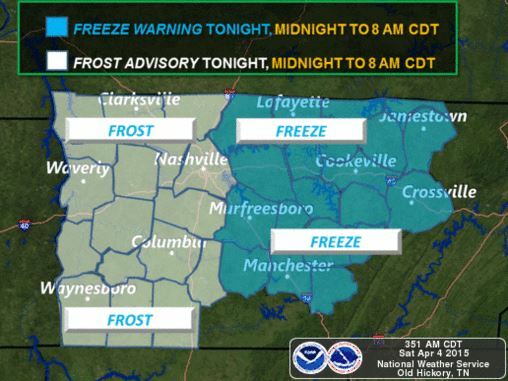 Update 3:30pm – NWSNashville has placed us under a FROST ADVISORY starting at midnight tonight and ending at 8am Sunday morning. Easter Day looks great as things warm up a bit more to 66 degrees with winds coming out of the south at 5-10 mph. Perfect day for Easter egg hunts. 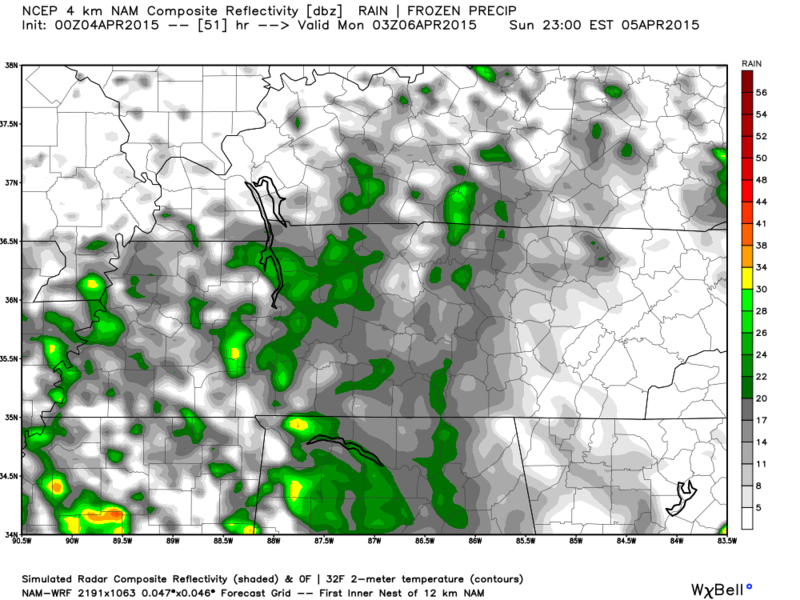 Sunday night however sees rain chances increasing to 50%. Some showers appear to want to come and bring us a case of the Mondays early. Here’s the NAM4 model for Sunday at 10pm. These don’t appear to be severe, just the typical thunderstorm if that. The Storm Prediction Center has us outlooked for general thunderstorms for Sunday. None are expected to be severe. The entire work week sees a chance of rain and storms every day. Unfortunately, rain enters the forecast again starting on Monday with a chance of rain about 60%. Rain and thunderstorms seem to be the main mode. At this moment, no mention of severe weather, but we will look more closely come tonight/tomorrow. Tuesday-Friday sees varying chances of rain and storms. High temps are expected to be in the mid to upper 70s all week. Not sure if any of these storm chances will be severe just yet, but we will keep an eye on it.